What do you do when you’ve an item of clothing that needs specialist cleaning, i.e. you can’t just bung it in the washing machine and hang it up to dry? Perhaps you panic because all the Dry Cleaners have closed down in Accrington? Well, worry not, because a brand new business, Acorn Cleaners Ltd., has come to Accrington, where the old Norths Dry Cleaners used to be at 1…7 Whalley Road. But this is a Cleaner’s with a difference! A few weeks ago the owner, Cheryl Duffy, contacted me to say she was starting up a new type of business and would I be willing to do the official opening as Mayor. Before the event she sent me some publicity material so I could see what it was all about. Cheryl says that Acorn Cleaners “is Lancashire’s first green alternative to dry cleaning using a Miele Professional Wetcare system. The business uses an innovative new environmentally-friendly system to provide deep cleaning to all dry-clean only garments, and is greener, cleaner and safer than other professional cleaning systems on the market.” She informs us that the traditional dry cleaning agent was a chemical called perchloroethylene which is extremely harmful to the environment and is already banned in several countries including the USA and France. The Wetcare system is suitable for a range of delicate items such as wedding dresses, UGG boots, leather coats, leather bags, Persian rugs, lace, silk, suede, suits, shirts and other dry clean only garments. This morning the Mayoress and I met Cheryl, her husband Brendan, family and friends, staff and also a large number of “advisers” who have some input into the business – representatives of the Miele machine manufacturers, legal, financial, pest control – you name it, they were there! The pest control, incidentally, is purely preventative as some “little visitors” had been seen on the premises while they were standing empty and before they were refurbished – they’d probably come in from a communal yard at the back. I’m sure they wouldn’t stand the slightest chance of survival now – everything is so sparkling clean! The shop was already open for business and items such as sheepskin coats, evening dresses, etc. were waiting to be cleaned. I said I must bring something myself to prove my faith in the company! Cheryl and Brendan hope that the business will be really successful and that in due course they may be able to open branches in other towns. So, why not give Acorn Cleaners a try? I asked why the name “Acorn” had been chosen, thinking of its connotation with the name “Accrington”. However, it was more a reference to the saying – I’m not sure whether I’ve got the wording exactly right – “From tiny acorns grow mighty oaks”. We wish Cheryl, Brendan, their staff and advisers all the very best with their new business. 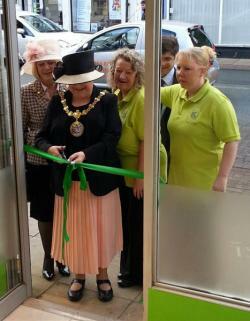 It’s also good to see one of Accrington Town Centre’s empty shops being brought back into use.